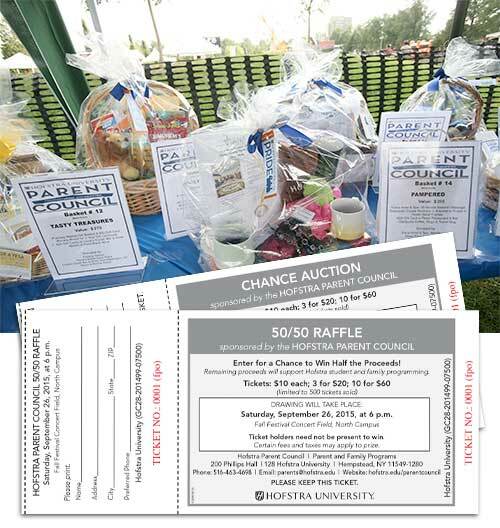 Each fall, Hofstra Parent Council organizes, through efforts of the parent volunteers, an annual Chance Auction and 50-50 Raffle. The volunteers ask families and vendors for donations toward the valuable chance auction baskets. During Family Weekend, the community members buy chances and place them next to the desired baskets or purchase the 50-50 chances. This year, the Parent Council Chance Auction takes place on Friday and Saturday, September 27 and 28. Below are selected Chance Auction prizes from last year. If you would like to donate an item or a basket, please email parents@hofstra.edu. Donations should be received by Friday, September 6th, 2019. If you are coming to Family Weekend, you will be able to view the prizes on Friday, September 27, 2-6:30 p.m. and Saturday, September 28, in the Mack Student Center (9 a.m.-4 p.m.) in the Multipurpose Room, Mack Student Center, North Campus. The silent drawing is on Saturday at 4 p.m. Winners do not need to be present but please pick up your prize as soon as possible. We will be in the Plaza Room Middle, Mack Student Center until 7 p.m. Saturday. Please be aware that there may be fees and taxes associated with some of the prizes. Thank you for supporting your Parent Council! Parent Council Chance Auction benefits student and family programs and events. The Hofstra Parent Council has decided that the proceeds of the most recent Parent Council Chance Auction are to equally benefit the Student Emergency Fund and the Family Weekend Fund. We are very grateful to Hofstra families, vendors and campus community members who contributed to the Chance Auction. Student Emergency Fund is used to assist students and their families in times of crisis or emergency and is administered with discretion by the assistant vice president of student affairs, in collaboration with the vice president of student affairs. Hofstra faculty and staff are encouraged to identify students in need who could benefit from a one-time financial help. The student affairs vice presidents will consider recommendations that are brought to them, in consultation with student financial services and other campus colleagues. Typically, this fund helps students replace belongings that have been destroyed or stolen, assists with travel expenses to be with family in an emergency, students who are in need of essentials (like food), and other similar situations. Donations and gifts to the Fund are welcomed from individuals or groups and will be used exclusively to provide direct support to students who are in dire need. Family Weekend, an integral part of the Hofstra Fall Festival, is the main campus event connecting parents and family members of Hofstra students to our campus. Faculty offers model classes to parents. Families get information about advisement, career education and planning as well as tour the Hofstra Arboretum and attend the student performance shows. Parents connect to their students and Hofstra faculty and administrators through social events. Every year, there are families who cannot afford to attend the Family Weekend because of the registration and event costs. Hofstra University and the Parent Council would like to make the events of the weekend more affordable and invite the members of our community to support the Family Weekend Fund.